Etiology: Staphylococcus aureus is a Gram-positive coccus that makes coagulase and hemolysin. S. aureus is frequently isolated from mucous membranes and skin and is considered resident or “normal” flora. Incidence: Guinea pigs have a moderate incidence of pododermatitis but colonization with bacteria is an uncommon complication. Transmission: Transmission occurs primarily by direct contact. Interspecies transmission of S. aureus has been documented. There are two disease presentations associated with S. aureus overgrowth. 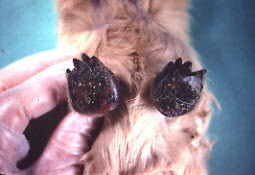 Pododermatitis is commonly seen on the palmar surface of the feet of animals housed on rough wire cage floors. Feet are swollen with crust-covered ulcers. There may be involvement of regional lymph nodes. Exfoliative dermatitis is commonly seen in multiparous dams and their offspring. Ventral abdominal alopecia and erythema, epidermal cracks and flaking (exfoliation) are visible. Pathology: In pododermatits, granulomatous cellulitis or chronic, fibrous granulomas with or without an exudative crust and possible bony destruction may be appreciated. In exfoliative dermatitis, epidermal cleavage with parakeratotic hyperkeratosis can be seen histologically. Diagnosis: Diagnosis is made based on clinical signs and confirmed by culture or PCR. An impression smear of the lesions and histopathology demonstrating large Gram-positive cocci in necrosuppurative lesions may also be used.